When you are hunting, it is easier to hunt with the party than by yourself. Because you can hunt monsters at a faster rate, so your experience will be gained at a faster rate also. Looking for parties by talking to people in the village or chatting throughout the whole channel is highly recommended. Party request can be done by clicking someone while holding the 'Ctrl' key. When an invitation is received, an invitation window will pop up. You may click on "Accept" if you wish to join or "Reject" if you do not wish to join the party. 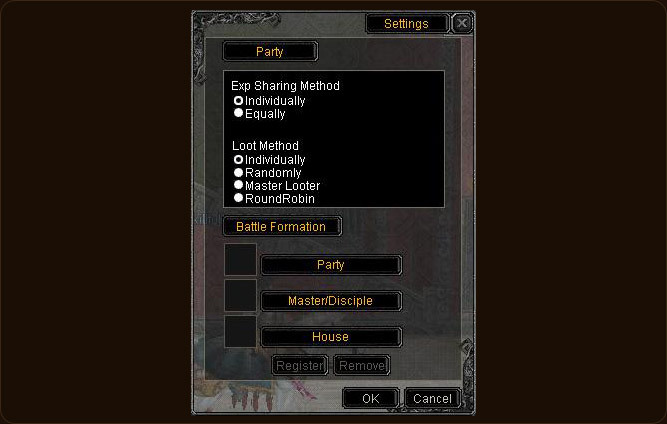 The party leader may set the experience sharing method and loot method. - Individually : Members will gain experience individually. - Equally : Total experience will be shared equally among party members. - Individually : Members will loot individually. - Round Robin : Each party member will take turns to loot. - Randomly : The permission to loot will be given randomly to party members. - Master Looter : The party leader will loot everything. 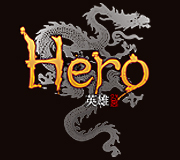 If you have joined a party, your party's information will be provided in the left-side of the screen with character's name colored in green. Your party will be displayed as a red dot in the mini-map. Number of players in a party is limited to 6. Party leader is able to kick out a player from the party by clicking the X button next to the member. An window will appear to confirm the action. If you want to leave the party, you may do so by Ctrl+clicking on yourself and choosing "Quit Party." This system gives options for the party leader to set different options for the party. It helps for a more interesting gaming experience. 1) Party leaders can CTRL+ Click on self to display the option UI. 2) Through the option window, you may set many different options. 1) If the level difference of party members are more than 20 levels, the benefits do not apply. (So, if the level difference is more than 20, you must use [Master/Disciple] System to gain regular experience..
2) Party cannot be created while in a war zone (Faction War, Flag Kingdom, Golden Basin, etc).